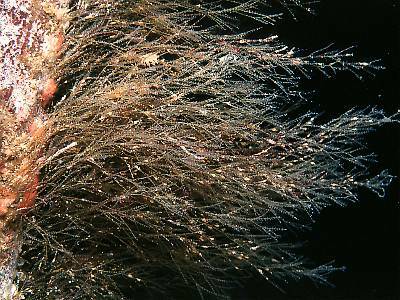 Description: This hydroid consists of fine, sparsely branched stems bearing paired hydrothecae. The hydrothecae are triangular in shape, with a hair-like outer cusp. The stems are usually clustered into small bushes, and are golden-brown in colour. Typically colonies measure 100mm in height. Habitat: This species is especially characteristic of the infralittoral zone where strong wave action or tidal streams are present. It normally grows on stipes of the kelp, Laminaria hyperborea, but may also attach directly to bedrock. Ecology: The nudibranch Doto eireana feeds exclusively on this hydroid. Distribution: Widespread on western coasts of the British Isles. Similar Species: This is a distinctive species, with finer branches than most Sertulariid hydroids. Picton, B.E. & Morrow, C.C. (2016). Amphisbetia operculata (Linnaeus, 1758). [In] Encyclopedia of Marine Life of Britain and Ireland.